Ask a group of airplane builders whether or not you should paint your own airplane and then stand back and listen. The opinions will equal the number of people present. The painting issue is very important since the final finish of our aircraft is most of what others see. When someone inspects your airplane they will also judge the quality of construction by the final finish. The painting needs to be done properly. If you have no painting experience you will usually view this as a formidable task. It is very tempting to dig out the yellow pages and begin looking for a professional painter. Professional painters usually have one goal in mind—provide a quality paint job as quickly as possible and then move on to the next job. Professional painters are often not familiar with the type of paints used in the sport aviation industry. This is particularly true with fabric covering topcoats. Painters are professionals so they are expensive. The cost of painting an airplane varies from one location to another but it is not unusual to be charged $3,000-$4,000 or more for a quality paint job. Professional painters have the advantage of a properly equipped facility along with top of the line painting tools. They also should be experienced with the preparation procedure and the painting process. It is very tempting to fly your airplane in and leave it with a pro. It is also noteworthy that hiring someone to paint your airplane does not affect the major portion rule of custom building. It is perfectly acceptable to contract the painting. You can complete a professional paint job on your custom built airplane even if you have no experience. Painting equipment and the paints used today make it much easier for an individual to paint their own aircraft. After all, you have spent years building this masterpiece so why would you want to hire out the painting? The custom airplane builder will spend more time and expend more effort in the painting process than will a professional. It’s your airplane! You have built it from the beginning with attention to every small detail. You want the same attention on the final finish. Sure you don’t have a bug free working environment like a professional shop and you may not have the experience of a pro but all custom builders possess two major advantages, the desire for perfection and the quality of perseverance. With those two characteristics you are capable of a professional looking paint job. Basically, all you need is proper equipment, time, the ability to follow directions, and practice. Even if you have never picked up a spray gun you can do the job. Now that I have persuaded you to paint your own airplane where do you begin? You will need some sort of paint facility, good painting equipment, and the knowledge necessary to prepare and paint the airplane. I will discuss all of these in this and the next article. I will discuss what type of facility is needed, spraying equipment, how to prepare surfaces for paint, and the actual process of painting. When should you paint your airplane—assembled or prior to assembly? A first time painter will be better served to paint the airplane prior to assembly. It is much simpler to paint the individual parts of an airplane rather than to paint the entire airplane at one time. However, most of our airplanes are smaller in size so painting the completed airplane is not as difficult as painting a large assembled aircraft. In either case there are ways to accomplish a quality finish that will be discussed later. Some builders will want to wait until they have test flown the airplane prior to painting. That enables them to correct problems and make necessary changes resulting from the test flying period. Some of these changes could affect the finish of the aircraft so they will wait until this time for final painting. Again, if you possibly can, paint the airplane prior to assembly. Painting an airplane is literally 90% preparation and 10% painting. Be ready to spend most of your time preparing surfaces for painting. The actual spraying process consumes a small amount of time. Remember also to practice-practice-practice. Before you begin applying the topcoats you will have acquired experience spraying primers. Obviously, the primer coat does not show so if spraying mistakes are made they can be easily corrected. You can also practice spraying techniques on large pieces of cardboard, old doors, masonite, stove pipe, etc.. If you are painting a fabric covered airplane you will have literally hours of practice spraying the more viscous coats of chemicals used on fabric. Then when you are ready to spray the final color coats you can do so with confidence. The bottom line is this—painting an airplane is usually approached with much more fear than is necessary. Whether or not you elect to paint your entire airplane you certainly will end up painting a number of small parts. Consider painting the airplane yourself. You can do it! Ideally you would have a clean, well lit, temperature controlled paint shop. Realistically, you will probably have to paint in your garage. Some builders are fortunate enough to locate a hangar or other such facility for their painting. Bear in mind that some airports will no longer allow painting unless the shop is designed and built to comply with local restrictions. Certain locations require the user of solvent based paints to filter overspray and have a method of collecting waste. If you are using a water based paint you will not be faced with this problem. You do not want to use your basement for painting. The fumes will permeate the entire house and you will not be popular with your family. A garage or workshop is adequate. After you have found a suitable location for painting the next step is to build a poor man’s paint booth. This can be done very easily by using PVC pipe and plastic sheets. Build a square frame out of wood or PVC pipe large enough to cover your airplane or the largest surface you will be spraying. You should allow enough space to be able to walk around the surface. You can hang the frame from your ceiling with pulleys so you can raise and lower it. Cover the roof and sides with plastic sheeting stapled or taped to the frame. Tape the sheets together using duct tape. At one end of the booth place a furnace filter and at the other end an exhaust fan. This will provide filtered air. Make sure the fan has an enclosed motor with no chance of sparking. If you are unsure about the fan, leave it out and quit spraying when the booth becomes full of overspray. The overspray will settle in minutes and then you can go back to work. Lighting is of utmost importance. Your booth should have an abundance of lights on moveable light stands or any other way you can arrange them. Shield the bulbs with chicken wire to prevent breaking which could ignite paint particles. When you are painting you cannot have too much light. You will also want to hang small pieces of your airplane for spraying. This can be accomplished by using welding rod hooked over a length of pipe. Then attach the small pieces to the welding rod. The length of pipe or wood can be suspended from the top of the spray booth. You do not want to paint in the following areas: (1) outside in fog or high humidity, (2) outside in direct sunlight, (3) in the wind, (4) in a dusty place, (5) in a rented or borrowed spray booth where you can’t take your time. You will usually not be able to paint when the temperature is below 60 degrees F. When you have finished painting you can throw away your paint booth or donate it to a friend. It is important that you have a clean, well ventilated, and well-lit area. Do not try to save money on painting equipment. High quality paint rigs produce high quality finishes. There are four basic methods of applying paints. They are: (1) conventional pressure fed gun, (2) High-Volume, Low-Pressure (HVLP) systems, (3) airless spraying, and (4) electrostatic spraying. Airless spraying and electrostatic spraying are used primarily in production work. Airless sprayers force paint through a small tip opening at extremely high fluid pressures ( usually 1200 to 3600 psi ). Using this amount of pressure affords airless sprayers the ability to spray almost any coating. Because of the high pressures airless sprayers are rarely used in the aircraft industry. Electrostatic spray systems charge the paint at the tip. A high voltage difference is set up between the paint and the object to be painted. The charge attracts the particles of paint and they wrap around the object. This type of spraying is used in factory applications. That leaves the custom aircraft builder with 2 choices of spraying equipment, conventional pressure and HVLP. The conventional system uses a high pressure source, usually an air compressor. The air compressor must be capable of delivering about 40-50 psi at the spray gun. This means the compressor must have adequate storage and be capable of supplying 90 psi+ at the compressor outlet. These high pressures push paint out of the gun and mix it with the airstream. Because the pressures are so high the paint is atomized effectively so that it can be applied to the surface. High pressure guns have been around for years. They can be used with large volume “pressure pots.” Pressure pots hold up to 5 gallons of material that is handy when applying doping chemicals used on fabric airplanes. The spray guns used for smaller jobs are usually suction fed. The same high pressure is used to atomize the paints. The coating is held in a quart cup and it is drawn into the airstream by the high pressure airflow creating a vacuum. If you are going to use the pressure-fed gun or the suction gun buy a good brand. Make sure the cup has a means of venting that will allow you to position it horizontally without dripping paint on your surface. The nozzles used with paint guns are as important as the gun itself. Certain nozzles are to be used with specific types of coatings. You will need to purchase the proper nozzle recommended by the manufacturer for the coating you will be spraying. If you choose the conventional spraying method be absolutely sure you have moisture traps and filters on your air compressor. Another point, if you are using a pressure pot you must keep the hoses clean. If they are not properly cleaned particles of old paint will be loosened and sprayed onto your project. A disadvantage of traditional high pressure painting is the high velocity of the paint particles as they reach the surface. Many of the paint particles will actually bounce off the painted surface and gather in the air in the form of a cloud called overspray. Often a large percentage of the paint itself (30-40%) which is used ends up as overspray on the floor or drawn through the filter. At the price of paint that can amount to a lot of money passing through a filter. Because of the waste and overspray problem, a new technology was introduced—High-volume, Low-pressure (HVLP). The pressure used in these systems to atomize the paint is much lower (3-5psi). The paint cup is pressurized forcing material to the nozzle. As a result, the overspray problem is minimized. Most of the paint actually adheres to the surface being painted instead of bouncing off and collecting elsewhere. To achieve this advantage a HVLP spray gun must be machined to a higher degree than an ordinary spray gun. The HVLP spray gun is designed to gather the air inside the gun and send it downstream with as little pressure drop as possible. This means careful machining must be carried out to reduce turbulence that impedes airflow. In older pressure guns if a passage was too small you simply increased the pressure and solved the problem. That means conventional spray guns do not have to be machined to exact specifications. Two types of HVLP spray systems are available. One is the turbine system and the other is a conversion spray gun. 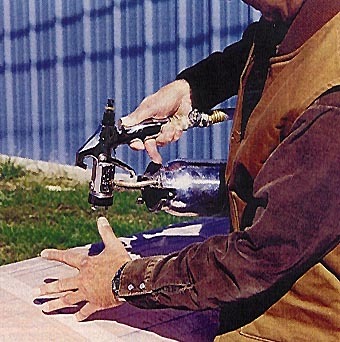 A conversion spray gun uses regular high pressure air and drops the pressure before it goes into the gun. A conversion gun is simply a HVLP spray gun with a regulator in its handle. This type of system requires a high capacity air compressor with moisture traps. The HVLP type we will discuss is the “turbine system.” An air compressor is not used with the HVLP system. Instead, the system is equipped with a turbine not unlike your vacuum cleaner. In fact, years ago Electrolux supplied a sprayer attachment with their vacuum cleaner. Evidently that was the first HVLP system. The turbine need only supply a large volume of air to the gun to work effectively—high pressure is not necessary. All that is needed is an air source that emits about 50 cubic feet per minute of air at less than 10 psi that is sufficient to power the HVLP spray gun. A turbine is a high-speed centrifugal blower motor operating near 20,000 RPM. Because of the high RPM the air is heated due to the friction. This heat serves to eliminate all moisture from the atomizing air. This heating effect also reduces the flash or drying time that helps to minimize blushing. 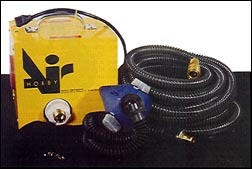 A HVLP system is sold with a turbine, hose, and spray gun. The majority of the cost is found in the spray gun and not the turbine due to the machining requirements of the gun discussed earlier. HVLP spray guns also are either non-bleeder or bleeder. The term non-bleeder means that when the user releases the trigger of the gun the air flow stops. With a bleeder gun the air flows continuously; the trigger only starts and stops the flow of paint. A bleeder gun will provide a better finish. However, use of a bleeder gun requires care because dirt and other objects can be easily blown onto a painted surface. Lets look at the advantages of the HVLP system. First of all, the overspray is reduced dramatically. That means a saving in coatings typically of about 30-40%. Secondly, an air compressor is not needed. The units come with a 110 volt turbine that can be used anywhere. Thirdly, the moisture problem is eliminated. One of the most significant problems a painter faces is the presence of moisture that can splatter onto a surface along with the paint. The heating of the turbine introduces heat that eliminates up to 95% of the moisture content. Lastly, HVLP systems enable the beginning painter to achieve a professional looking finish. They are easier to use than conventional spray outfits. Individuals who have experience painting with conventional spray outfits will have to learn the different techniques required to use HVLP systems. HVLP systems expend heavier amounts of material than conventional guns. This, of course, means different techniques. Remote paint pots with capacities of 2.5 gallons are also available with these systems. To conclude, HVLP paint systems have obvious advantages. Two different brands are shown in the article. The price of these units is usually between $700-$800. That includes the turbine, 30 feet of hose, and the spray gun. You will also want to purchase additional nozzles for the spray gun depending upon the type of paint you are spraying. Many people recommend an additional length of hose that reduces the temperature of the air reaching the spray gun. If you have a conventional system that is high quality then by all means use it. Professional painters have been using conventional systems for years with excellent results. Certain health hazards do exist with spray painting. Of course, the hazards depend entirely upon the chemical that is being sprayed. The most significant health hazard occurs when atomized chemical particles are inhaled. You must protect yourself with an adequate respirator. 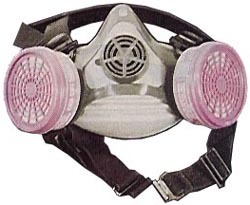 A charcoal filtered respirator, such as the one pictured, is sufficient for most primers, dopes, and paints. However, if you are using any type of polyurethane paint you should have a forced air breathing system. Polyurethane paints emit polyisocyanides that can be extremely hazardous to certain individuals. Some people have severe reactions to polyurethanes so don’t take a chance. A simple forced air breathing system is pictured and is manufactured by HobbyAir. It is available for less than $400. A good investment to protect your health. A forced air breathing system available from HobbyAir.You also need to protect your skin. Wear Invisible Gloves barrier cream or latex gloves when mixing or spraying. I would also recommend you purchase a Tyvek spraying suit. They are not very expensive and they will protect both your skin and your clothes. If you do not use one of these suits wear long sleeves and long pants. If you spill solvents on yourself, remove your clothes and wash the area with soap and water and put on fresh clothes. Do not mix paints with an electric drill. The motor could spark and cause a fire. Use eye protection in the form of goggles when mixing and spraying. Keep an eye wash station nearby in case of emergency. You should also have fire extinguishers handy that are rated for petroleum fires. Under certain atmospheric conditions the action of sanding or spraying can generate static electricity. When this static charge is transferred to a surface the resulting spark could ignite solvent vapors. Ground the structures being sanded or sprayed. Now that we have determined that we can paint our own airplane, we know what facilities are required, and we understand the equipment, our discussion next month will be how to prepare different types of surfaces and followed by a discussion of the actual spray painting process. Aluminum surfaces are treated differently depending upon whether the metal is new or used. Paint must be able to “grip” or adhere to the surface onto which it is applied. Most aluminum surfaces have a layer of pure aluminum on the surface called alclad that protects the metal from corrosion. It is very smooth and not favorable to paint adhesion. Therefore the surface must be adequately prepared by cleaning and slightly roughening to guarantee primer adhesion. This is accomplished by using a conversion coating such as alodine. This chemical process creates a ceramic layer over the aluminum that coats the surface and provides tooth adhesion. 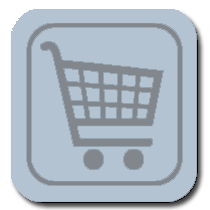 Used aluminum must have any primers, paints, or corrosion removed. Paint strippers are used to remove old paint. After stripping old paint the corrosion should be completely eliminated. Use fine sandpaper, Scotch Brite pads, or aluminum wool. Never use steel wool or a steel brush. After the corrosion is removed the old aluminum should be acid etched. This is simply a process of washing the aluminum with a product such as Poly Fiber’s E-2310 Acid Etch diluted with water. An acid etch removes oil and light corrosion while etching or roughening the surface to provide a firm primer bond. The part is then thoroughly rinsed. Next wash the surface with E-2300 Conversion Coating that inhibits corrosion and further enhances primer adhesion. After this step the part is rinsed and allowed to completely dry. Once again, new aluminum surfaces need only be treated with a conversion coating. After the aluminum (new or old) has been properly cleaned and treated, it is then primed. I would recommend using a two-part epoxy primer. An epoxy primer will insure corrosion protection and also provide a bonding surface for most topcoat paints. Very often, polyurethane topcoats will lift or wrinkle primers other than epoxies much as a paint stripper would do. A primer is necessary to provide a bond between the metal and the final topcoat paint. The primer coat should be applied according to the manufacturers directions. Usually, two light coats will be applied. Heavy coats should be avoided. Steel surfaces are much more susceptible to corrosion problems in the form of rust. This rust must be completely removed prior to priming the part. Of course, any old paints or primers will usually be stripped. Certainly, if you are going to paint over the existing topcoat you must still deal with any rust that might be present. Removal of old paints can be accomplished with a bead blaster or sand blaster. However, this must be done without pitting or damaging the metal. Using the proper amount of pressure in blasting is essential. Once the structure has been stripped and the rust eliminated, the metal must be protected within 1-2 hours. Be sure to have the primer and spray equipment ready before you begin blasting or cleaning. Rust will begin to form on a bare steel surface within a very short period of time. Just as with aluminum, after cleaning the structure prime it using an epoxy primer. Be sure to clean the surface with a surface cleaner just prior to priming. Wooden surfaces are usually covered with fabric. They still must be properly prepared to prevent rotting problems from moisture. Usually the part will be dry sanded and then varnished using a two-part epoxy varnish. Solvents used in fabric covering systems will “lift” most varnishes other than epoxies. If you plan to paint directly over the wood itself, an epoxy varnish must be used. Fiberglass parts should be sanded smooth and primed using an epoxy primer. Of course, if you are building a composite airplane the surfaces must be filled and primed in the manner discussed in a previous article on composite construction. Proper sanding is a very important step in acquiring a high quality finish. If you want a high gloss you will spend time sanding. Sanding is usually accomplished using wet/dry sandpaper and water. The grit of sandpaper used is dependent upon the surface and its roughness. Usually 180 grit all the way to 600 grit or higher sandpaper is used. Sanding actually flattens the surface of the object you are painting. It also removes any imperfections that may be present such as small pieces of dirt. You should use a sanding block when possible. Pneumatic orbital sanders can be used in larger areas. When holding a piece of sandpaper in your hand, fold it in thirds to maximize the use of the sandpaper. You can more efficiently use the paper this way. A straight back and forth movement is preferred over a circular movement. Sanding 45 degrees one direction and then 45 degrees in the other direction works well. You have a choice of the type of topcoat paint along with a large number of brand names. Enamel is a paint that is commonly used on aircraft surfaces. These paints are sprayed over epoxy primer after being thinned to proper consistency using enamel thinners. A light, mist coat is first sprayed on and allowed to dry for a few minutes until it is tacky to the touch. This is then followed by a full coat of enamel. One full coat may be sufficient or another may be sprayed if desired. The use of enamel is not as popular as it was in the past. A second type of topcoat paint is acrylic lacquer. This paint has a low solid content that makes it more difficult to apply. Acrylic lacquer should be thinned using the proper thinner and then a very light tack coat applied. An additional 4-5 cross coats of paint will then have to be applied allowing about 30 minutes drying time between coats. (By the way, a cross-coat is defined as moving the spray gun north and south followed by east and west—one cross coat). Polyurethane paint is probably the most popular choice for a topcoat today. It is very durable and provides a high gloss finish. It is also chemically resistant. These paints have a high solid content and they cure very slowly which means they continue to flow out for a long period of time. This flowing out process forms a very flat surface that gives the surface a high gloss look. Polyurethane enamels are mixed with a catalyst prior to use. They are then reduced to proper viscosity for spraying. A very light tack coat is first applied followed by one or two full coats. One problem inherent in polyurethanes is the thickness of the film applied. If the paint is applied too thick it may tend to crack over a period of time. This is especially true when applied over fabric. The fabric on an airplane will flex and move during flight. This movement coupled with the thickness of polyurethane paint can present a problem. Polyurethane paints designed for fabric airplanes are manufactured and should be used when painting over polyester fabrics. The one major problem encountered when using polyurethane paints is its toxicity. Breathing the spray mist from polyurethanes may cause severe sickness or even death. With this in mind, you must use a forced air breathing system such as the HobbyAir system. You should also protect your skin and eyes. If you are painting a fabric airplane, you can use a specially designed polyurethane topcoat, butyrate dope, or Poly-Tone. Butyrate dope and Poly-Fiber’s Poly-Tone are both very easy to apply because they are more viscous. Therefore, they are less likely to run when applied. No matter which paint you choose a few fundamentals apply. First of all, the paint needs to be properly mixed. That means shaking the paint on a paint shaker within one week of application. After shaking the paint it should then be thoroughly stirred just prior to use. Secondly, the surfaces should be wiped down with a paint cleaning solvent using a clean rag. Then a tack rag should be used to remove any dust. Thirdly, the paint should be properly thinned by following the manufacturers directions. A viscosity cup can be used for the thinning procedure. These are small cups with a hole in the bottom. The cup is filled with paint and then the viscosity is determined by the amount of time, in seconds, required for the paint to flow through the hole until it begins to drip. The next step is to strain the paint through a mesh paint strainer. This should be done prior to placing the paint into the spray cup. If you are using a polyurethane paint, you should strain the paint prior to mixing the catalyst. Mixing the catalyst in polyurethane paints should be done in accordance with the directions from the manufacturer. Usually, you should let the catalyst react with the base paint for at least 20 minutes prior to spraying. Once you have mixed the paint you will have approximately 5 hours before the chemical crosslinking begins and the mixture begins to thicken. With that in mind, only mix the amount of paint you will need for the job. If you mixed too much paint you can place it in a freezer (not with food) overnight, remove it and allow it to reach room temperature before spraying. The cold temperature delays the crosslinking process. When applying the final color coats, always be sure the paint you are using has the same batch number. Slight differences in color can often be found in different batches of paint. One solution is to open all of the cans of paint you will be using and mix them together in a large container. They can then be poured back into the original containers after being mixed. Other chemicals in addition to reducers that you may encounter are retarders and accelerators. A paint retarder very simply is a solvent that slows the drying time of the paint. It is added in proportion to the directions on the paint can. Retarders are generally used in high temperature or high humidity conditions. Accelerators have the opposite affect. They speed up the drying time. Accelerators may be required to help the drying process in cool temperatures. – Drop cloths to protect the floor. Now let’s discuss the actual process of painting. The most important aspect of learning how to paint can be summarized in three words—PRACTICE, PRACTICE, PRACTICE. Do not practice on your airplane. Get several pieces of cardboard and learn how to properly set up the spray gun. Then practice the spraying technique on the cardboard. Next, spray pieces of metal lying flat on a surface. Then spray the metal pieces hanging vertically. When you feel really confident, buy a piece of stovepipe or a large diameter pvc pipe and paint it. Stand it vertically and paint the entire piece. When you can do this without major mistakes you are ready to begin on your airplane. If possible, always begin the painting process with a small control surface. 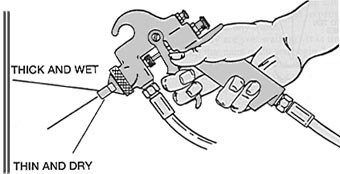 The actual adjustment of a spray gun depends upon the equipment you are using. The manufacturer should provide you with a set of instructions on setting up the gun. You should use the type of spray gun nozzle recommended for the type of paint you will be spraying. The gun should be properly adjusted each time you spray. A test pattern should always be sprayed on a piece of cardboard before beginning to paint. The normal pattern for a spray gun will be fan shaped. To begin the actual application procedure, hold the spray gun approximately 8 inches from the surface you will be painting. Spreading your fingers as illustrated in Figure 1 will usually approximate this distance. This distance may vary somewhat depending upon whether you are using a HVLP system or a pressure spray gun. The spray gun should be far enough away so the paint does not run or sag when applied and close enough to lay on a wet coat. To prevent the paint from being uneven, it is imperative that the gun be held exactly perpendicular to the surface. If it is tilted the paint will be heavier on one side and lighter on the other. See Figure 2. The spray gun should then be moved parallel to the surface only the distance you can comfortably move your entire arm while keeping the movement exactly parallel. See Figure 3. If the gun is moved in an arc the material will be applied heavier in some places and lighter in others. You should squeeze the trigger of the gun just prior to beginning the paint stroke and release it just before it is completed. You then should move up or down approximately � fan width and begin the next pass. You must overlap the passes to achieve an even build-up. Each pass of the gun will usually apply the paint more thick in the middle with a tapering off on each end. Remember our definition of a cross-coat, one pass north and south followed by a pass east and west. If the gun is not held perpendicular to the surface, one side of the spray pattern will be wet with a tendency to run, and the other side will be rough and dry. Proper lighting is absolutely essential when painting. For best results try to position your lights 45 degrees to the surface being painted. 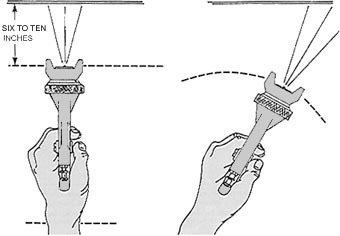 By looking into the glare of a light you will detect heavy and light areas of material. Of course, heavy areas will often result in sags or runs. Paint the edges of the structure first. Edges often do not receive an adequate amount of paint. Painting them first will solve this problem. If at all possible, paint on a flat surface. Of course, that is not always feasible. Paint will sag or run much more easily on a vertical surface. Spraying in corners and around corners presents a problem. Practice in areas such as this to establish the proper technique. As a general rule, spray the corner first whether it is inside or outside then you can blend the paint in with subsequent strokes. As I mentioned last month, it is much easier to paint your airplane prior to assembling it. Practically speaking many builders will assemble their airplane, test fly it, and then paint it. If you do paint your airplane while it is in one piece there is a definite sequence you should follow. First of all, you will want to paint ends and leading edges of surfaces. Paint the bottom of the airplane first by beginning at the tail. Spray from the tail control surfaces all the way up the fuselage to the engine then spray the underneath side of the wings. It is much easier if you can persuade another painter to help you. That person can paint at the same time you are painting with one of you staying slightly ahead of the other. Often it is impossible for one person to reach entirely across a wing. The trick of the entire process is to keep the surface wet all the time. The paint spray gun must be moved parallel to the surface. If the gun is moved in an arc, the spray pattern will be thick in some spots and thin in others. Once you have completed the base color you will then be ready for the trim colors. A sufficient amount of drying time should be allowed once again according to the manufacturer’s recommendation. Usually at least 12 hours is needed. Some poly urethane manufacturers direct users to wait at least one week until the paint is more fully cured. After one week the area to be painted should be lightly sanded to provide tooth adhesion. Use the best grade of masking tape available. I would recommend 3M’s fine line tape that is designed for trim use. Remember, do not use newspaper to cover areas—only good Kraft paper. Apply the tapes and then use a small plastic squeegee to press down the edges of the tapes just prior to spraying. Pull the tapes off when the paint dries to the touch, usually 1-2 hours. When pulling the tapes off pull toward the new paint. Do not leave the tape on for a long period of time. You will encounter problems. Runs and sags are perhaps the most common. These usually form as the result of improper spraying techniques, such as the gun too close to the surface, or the material is too thin. When you create a run or sags simply stop and let the paint dry. If it is a polyurethane you should let it dry several days. Then go back and sand out the run or sag and respray the area. An orange peel look is also a common problem. That usually results from the air pressure being too high in a pressure gun, the paint too viscous, or improper solvent. Blistering of the paint is a result of the surface not being properly primed or moisture being present on the surface. A coarse finish is another problem that occurs because the surface was not thoroughly cleaned. The final step is the one everyone dislikes—clean-up. If you are going to preserve your spray gun you must clean it thoroughly. This means taking the gun apart and cleaning it with a solvent, either reducer or MEK. Remember, protect your hands from any solvent. After a complete cleaning some painters will actually leave the nozzle of the gun in a solvent until the next job. You also want to properly dispose of any waste. Why are you waiting? It is time to buy that paint outfit and begin. I believe with proper equipment, a modest facility, and a lot of practice you can apply a high quality finish on your airplane. Take your time. You will take more time than a professional painter because it is your airplane. You can do it.